Transform your backyard space into a relaxing retreat with the Serta Tahoe Outdoor Sectional. Inspired by luxury outdoor furniture designs, this sectional sofa has the elegance of furniture found at a five-star resort. Its graceful sloped back and arms flow effortlessly into an elegant right-facing chaise lounge. Once you sink into the thick comfortable cushions, you’ll have a whole new appreciation for the word lounge! 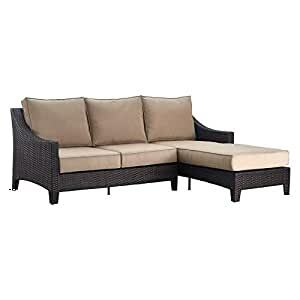 The Tahoe Outdoor Furniture Collection from Serta is ideal for relaxing in the sun, and is made for all types of weather with its resin wicker shell and quick-drying olefin fabric cushions.